These online courses are available on a one-to-one individual basis as well as sometimes as a group course. People are finding the flexibility of start date and around holidays make the one to one courses very convenient. All courses are held on-line. I have had some wonderful feedback from past courses – some of which is below. 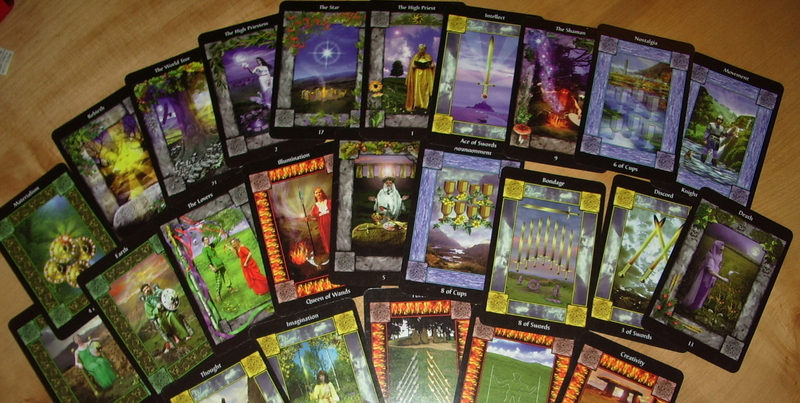 This is an experiential rather than a theoretical course and is designed for those who have some experience with a tarot deck – we are assuming knowledge of how to read tarot generally – spreads, linking cards etc. though we won’t assume any knowledge of the Sacred Circle or specifically RWS decks. My approach is basically from a psychological perspective, using the my digital book exploring the Sacred Circle deck in particular, and an intuitive angle, using visualisation into cards to gain our own information. We will look at personal blocks to accessing your intuition and there will be quite a bit of personal work. Independent, individually run versions of this course can start at a time to suit you, with breaks for school holidays. If there is a group of you who would like to learn together this can be arranged too, it would still be online, but the group would share a private forum area for the course where you could also share with each other. Contact me below for more information. The course runs for a total of 16 weeks including the introductions week and a feedback week at the end to tie up loose ends. A new topic is set every 2 weeks; the first week is for doing the exercises for that topic, the second week is for responding to tutor comments on your work and to allow you to read and become familiar with others’ work, ask questions, and if in a group, share comments and knowledge with other students. This enriches the experience for everyone. 14 week course teaching with 2 weeks intro and feedback to give space to the course. There will be breaks in the course for school holiday periods, during which you will have the chance to have a break or for independent study. Weeks 2 + 3: Your Deck and you. Your journey with your deck. Exploring your current connection with the deck of your choice or the Sacred circle and gaining the guidance on how you need to approach your learning and development. Weeks 4 + 5: Your Deck and your shadow – cards you love/cards you hate. Inner work with the Your Deck. Weeks 6 + 7: Journeying into a card, speaking with characters and objects within a card, intuition development. Weeks 8 + 9: Free association with the cards, building your intuition, releasing blocks to trusting your intuition. Weeks 12 + 13: Standing back from a reading, using all the approaches in a reading together. Weeks 14 + 15: Recap – where are you now with your deck. What are your next steps? Individual attention – minimum 2 hours of tutor time each topic, so you get the attention you would in private lessons. Held on a one-2-one basis on a private forum area for full confidentiality. Experience of reading for others with the tarot. Free digital copy of my workings with the Sacred Circle deck as a template and guide for your own work. Course completion certificate, for all those who complete all exercises by the end of the feedback week. Current price £320 payable by cheque or through PayPal, the details will be given after acceptance on a course. Payment by installments can also be arranged – please enquire. Basic tarot knowledge, general meanings etc. and mail it to me using the contact form below. “I have studied with Emma for three years now, in both her online courses and one to one mentoring. All have been brilliant, illuminating experiences. As I wanted to further my understanding of tarot, in particular its background and evolvement, she kindly designed a course for me – History and Symbolism in Tarot. I completed it last week and it has been not just edifying but has completely changed my attitude and approach to my readings and tarot in general. I understand Emma may be offering this course in the near future and I would urge you to consider it if you enjoy an academic challenge and I can assure you it will not only enrich your knowledge base but give even more depth to your readings.